This paper attempts to discuss what wind power is and how it is used for mankind. Wind energy that can be utilised at the microlevel by man for various purposes. Let us understand what wind energy is first. Wind Energy: Wind is a free, clean and inexhaustible source of energy. This wind is a by- product of the sun’s energy. The surface of earth heats and cools unevenly, creating atmospheric pressure zones that makes air flow from high to low pressure areas. Hence about 2% of sun’s energy reaching earth gets converted into wind energy. Wind energy has been used for several years for propelling ships, to grind grain, pump water, irrigation, navigation etc. Wind energy is generated by the kinetic energy of atmospheric air. Wind power systems uses this kinetic energy of wind into useful sources of power. The tool for the wind power to be utilized is through Turbine. Wind turbine is a device which has alternator attached to a propeller which has blades that receives the kinetic flow of wind and moves. Hence when the wind blows, the propeller turns and the alternator begins to produce power in the form of electricity. 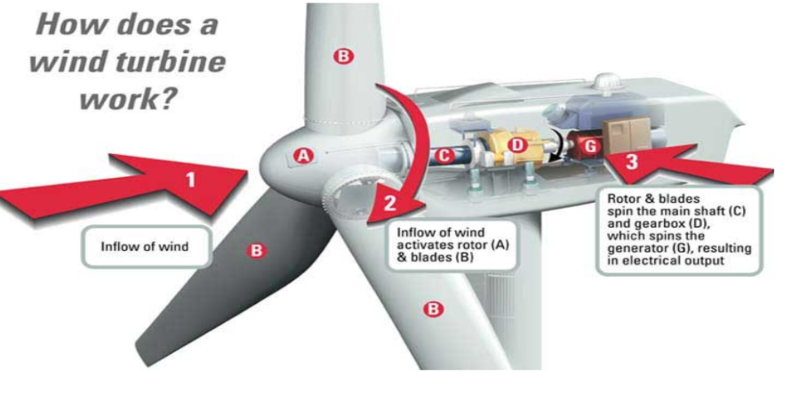 Attached is the diagram of wind turbine working mechanisms. With different turbines having different blades or propellers, low speed generators either have long rotor blades or larger number of short, wide blades which helps to drive more power from low wind speeds. While high speed generators are built with narrow and relatively short blades in order to minimize potential rotor damage in areas which is exposed with high to extreme high wind speeds. The process of conversion of wind energy requires technological advancement which is rapidly growing. There are three types of typical generator system. Understanding the concept of turbine with respect to its rotational speed and wind flow, there are 3 designs in particular that can be classified into fixed speed, limited variable speed and variable speed. drive train components- wind energy concept can be classified into geared drive which is a specific multistage gear with high speed generator that forms that part of turbine system while the other is a direct drive wind turbine which has a single stage gear and a low-speed generator. Keeping the above categories there are 3 basic wind power systems that have been prepared for the practice of energy generation. Fixed Speed wind turbine: this uses multi-stage gearbox and standard induction generator directly connected to grid. Variable Speed wind turbine: uses multi-stage gearbox with doubly fed induction where power electronic converter feeding the rotor winding capacity. Variable Speed turbine: this is variable but this is gearless turbine system with direct drive generator and full scale power electronic converter. Basic need for implanting wind power system is to ensure availability of a place where wind blow is at its fullest. The turbines are placed either on the rooftops on the house or to be mounted in an area which is free from the obstructions to the wind. Though it is highly recommended to have the Wind turbines away from rooftop for precisely two reasons. One, the turbines vibrate which transfers to the frame of the building, secondly higher the wind turbine in the air the more effective it is. The wind generators do not produce direct current, it needs a rectifier that converts the energy into Direct Current or DC. Though some turbines have the rectifier built in and other cases rectifier is supplied as a separate component. Electricity Generation: if the wind is blowing, they will produce current even if the battery needs any charging or not. Hence wind generators are “Active” electricity producers. Therefore in order to prevent damage, electricity must be used in some way . If battery is not charged, the electricity will be generated by the wind power system. But if it is fully charged, then the turbine’s output must be diverted. These are some control mechanisms that allow the electricity to be used while preventing any damage to system. Once when this load diverter is attached to the wind turbine and storage battery, electrical system can be connected to the batteries either directly for matching a voltage DC system or through an inverter for an Alternator Current or AC and/or mixed AC/DC current system.